For example, some 20 years ago my "bff", Gail, and I spent a good many evenings at a local Mexican restaurant, Chevys (a chain, we were in Northern CA). They served up the most mouthwatering flour tortillas fresh for "La Machina", tender, almost buttery tortillas that seemed to melt in your mouth. I began my love of the Margarita during those years as we sampled our fair share while pouring out our hearts to each other. We shared our dreams, dating frustrations, and general chatter as we dipped our warm tortillas into the freshly made salsa and guacamole while sipping our "ritas". A few years later had me married and moving away to Kentucky for a short time. No Chevy's there, however as I began my trek into the food world I learned to make my own Mexican inspired dishes. I grew my own tomatoes and cilantro for the salsa, whipped up a mean guacamole and even learned to mix a darn good Margarita. While Chevy's has lost some of its appeal now that I've "matured" (the margaritas are too sweet for my taste and the salsa... well, I think mine is better) I jumped at the chance to place the Chevy's & Rio Bravo Fresh Mex Cookbook on my shelf. I have to admit that in the last few years I've sort of forgotten about the book, but recently took it off the shelf and thumbed through the familiar recipes. With a Trader Joe's Carne Asada thawing in the fridge I needed a bean recipe to round out the meal. Beans a la Charra jumped off of the page reminding me of another favorite from Tiffany at I Don't Cook, But My Boyfriend does. Her Pinto Beans that Rock have become a family favorite (highly recommended!! ), and I've made them so often I almost don't need to refer to the recipe. 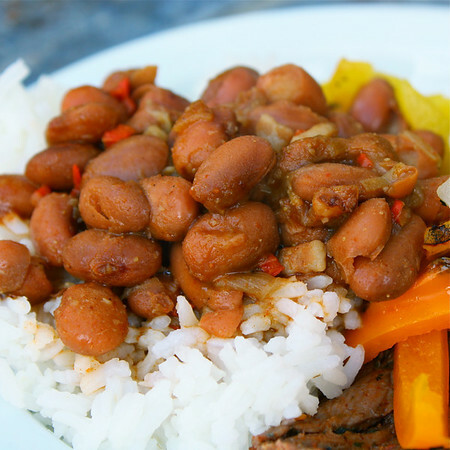 Beans a la Charra is nearly the same, but changes it up with a different spices. 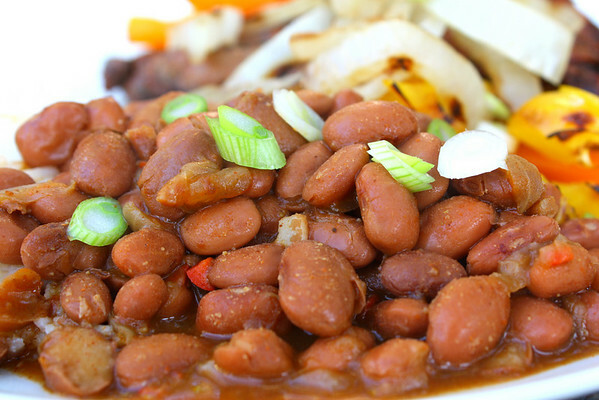 A couple of cans of Pinto Beans start us off when they are combined with flavorful diced onion and chopped bacon. With my winter jalapeños bright red on the bush I eagerly diced one up for a little added spice. Garlic, chili powder and cumin round out the flavors giving these tender beans a Fresh Mex appeal. Our thoughts and prayers continue to be with Monet, Anecdotes and Apple Cores, and her family as they struggle with a tragic auto accident which struck her sister's family recently. Chef Dennis has written a beautiful guest post on her blog which sums up our feelings about the lovely Monet. In a saucepan cook the bacon over medium-high heat until nearly crisp, about 4-5 minutes. Add teh onion and jalapeño and cook until tender, another 4-6 minutes. Add the garlic and cook 1 minute longer. Stir in the chili powder and cumin. Add 1 cup of lower in sodium chicken broth. Add the rinsed and drained beans. Add enough water to cover, and allow beans to simmer for about an hour, adding a bit of extra water if they dry out too much. Taste and add desired amount of salt. Serve beans with your favorite toppings, salsa, queso fresco, green onions, avocado, etc. Enjoy! **This post has been entered into Denny's and/or Foodbuzz BACONALIA challenge and is an entry for a chance to win a prize! Oh how I adore Mexican food! There used to be quite a few spots in KS that I loved to go to, they had some really authentic stuff...I miss that! What time is dinner? I'll be over with Margaritas :o) I'm always looking for great bean recipes to have along side our many Mexican meals and this one would definitely fit the bill. Thanks for sharing! I heart Mexican food... I have my in-laws over who SWEAR Mexican and Tex Mex food is gross. So far I've made chili and enchiladas which they are STILL raving about. These beans will convert them for sure.. Thanks for sharing! Oh, and I brought the cookbook... I'm a cookbook junkie. Mmmm...love frijoles a la charra! These look so good too. If you add a bit of beer to them when you heat them up? Borracho beans...another favorite of ours. And BTW? I also find myself reminiscing about things 20 years ago and have to pinch myself (or look in the mirror...) to remind myself I'm 45 instead of 20something :lol:. This is really delicious! Simple, but hearty and tasty. Looks amazing! This sounds absolutely delicious! I love beans, and always discovering new ways to make this is great! And Monet is definitely a sweetheart. I know my heart and prayers have been going out to her and her family. I love beans, and mexican food: thanks for this recipe! My husband loves beans, me not so much, but I'll have to make these for him, when he makes his enchiladas. the beans would be a nice accompaniment for the enchiladas, and Margaritas, of course! I love the beans at Mexican (or is it "Mexican" when it comes to chain restaurants?) restaurants. This spin on them looks delicious! wow wowww..I had beans two days ago and I could have them tomorrow again..LOL!!! 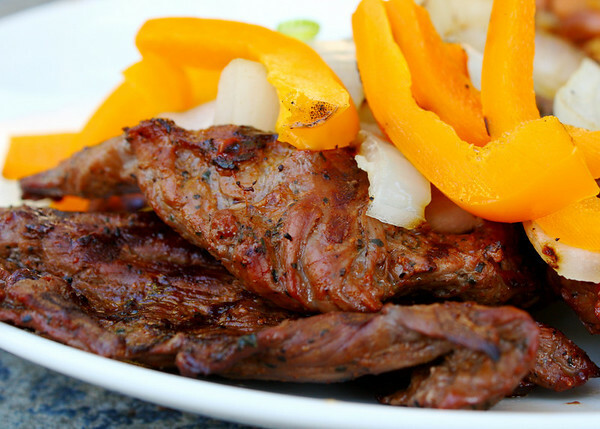 This is such an amazing recipe and wonderful meal all together!!! These look great! I never heard of Chevy's till I saw one near Disneyworld last April. I agree that Chevy's has lost a bit of the luster it did when we were younger. Your beans sound amazing and a must try. I too love the carne asada from Trader Joe's. Have not had dinner yet and you are making me hungry! I love how versatile this is, you can mix it up with several different dishes and have a new meal every night. Such a delicious meal for a week dinner. So easy to make and packed with lots of flavors. I would love some beans for breakfast! The photograph of the beans is just leaping out at me, looks like they would melt in your mouth and the flavours - I love. i am not a bean lover .. but my husband is. We make something similar and we call it Rajma and he loves it :) I am sure this is something he will like too ! Yum! I have spent many years of my life in El Paso, Texas so I know good Mexican food. These charro beans look super yummy. Though I've never used canned beans to make mine, I'll bet they are a whole heck of a lot faster than cooking for 8 hours. Thanks for sharing. And I agree...Chef Dennis definitely summed up our thoughts about the lovely Monet very well. I have yet to find somewhere here that makes good Mexican food. These beans look like they would be a great accompaniment to my quesadillas tomorrow night. This sounds gorgeous. There is a sad lack of Mexican food here in Ireland (we are 5180 miles away so that might have something to do with it :) I'll just have to rely on my foodie friends for gorgeous recipes like this one. Good luck in the competition. This sounds great! I am a huge fan of Mexican food... these spicy beans sound great! I love this recipe. I lived in Tucson Arizona for 15 years, and now soooo miss delicious authentic Mexican dishes. Nice to find this lovely recipe!